Dog Training Corrections are controversial, but what do we know of them? We can start by learning what dog training corrections actually are, because the fact is that we all use them in some way. This is one of the most difficult elements to talk about because there is so much misinformation about this subject and there are many misrepresentations about them; in dog obedience training, how and when to use them, which type of correction to use and how to apply it, for example. One of the leading factors is that dog training is a big business and there are many dog trainers out there with limited knowledge or many others who stick to a certain type of dog training with such a passion that it almost becomes a religion. Newspapers, media and the internet are filled with “positive-only dog trainers” who claim to never use corrections, and in most cases dog training corrections are put under the label of “negative reinforcement” which is an incorrect interpretation of the phrase itself. The truth is that you will use dog training corrections in one form or another in dog obedience training. Yes, even “positive-only” training as well as any other training and everyday situations. In order to explain this further we need to understand the basics of animal learning. Operant conditioning! Operant conditioning generally describes a way in which animals learn. Since this is a relatively complicated theory or at least it is if you are dealing with it for a first time, I will try to simplify it as much as I can. In this context, positive and negative doesn’t mean “good” and “bad”, as the majority of people believe. Now that we have the meaning of each quadrant explained, let’s give an example of how they work in real life. -Positive reinforcement: you ask your dog to sit…your dog sits…you give him a treat. It is positive because you are adding something to the equation (a treat), your dog likes that therefore he will offer that behavior again in the future (reinforcement). -Negative reinforcement: you command your dog to sit and apply leash pressure upwards, your dog sits, and you remove the pressure. Negative –you are removing something (leash pressure), reinforcement –dog learns that by performing the sit position he can turn off the pressure therefore he will offer the sitting behavior more often. -Positive punishment: you tell your dog to sit, he disobeys and you apply a leash correction. Positive-you are adding something (leash correction), punishment- next time it is less likely that your dog will disobey. -Negative punishment: you command your dog to sit, he doesn’t, and therefore you withhold a reward. Negative- you are taking away the reward from the equation, punishment- it is less likely that disobedience will occur in the future. -Extinction: Extinction as a training method has become more and more popular thanks mostly to groups of clicker training dog trainers who are willing to learn and try new things. It is a powerful tool in your dog training box (as well as a part of operant conditioning). The theory behind extinction is pretty simple;ignore the dog's behavior so that the dog can't get any reinforcement out of it. The problem with this approach is that it takes some time and several repetitions before things start changing. Pros: This is a very powerful way to deal with behaviors, and normally, once the behavior is gone it is a permanent result. Cons: It takes time, and if you are not strict, or you are inconsistent in your efforts (meaning if the dog manages to get a result from his behavior from time to time) you are actually strengthening the particular behavior by unconsciously putting it on a variable (or random) reinforcement schedule. It is most often because of this reason that dog owners or trainers don't manage to succeed, or they simply decide to quit. Another factor that will get in your way is the "Behavior extinction burst". This is the normal process that happens when a behavior is changing. It is at this point when many dog owners and inexperienced dog trainers decide to quit or they conclude that the approach doesn't work. And that’s it. I tried to use the most simplified example in order for you to understand the concept. If you look at it closer you will see that technically only one of these quadrants is highly rewarding for a dog (positive reinforcement) and the other three either use some type of physical correction or negative outcome (like withholding a reward, for example) in order to modify dog behavior. Out of the four quadrants that make up Operant conditioning, only one is rewarding the other three all fall under the “correction” umbrella. This applies in 90% of dog training and a dog’s life. It is important to know that you can’t avoid dog training corrections they are a normal part of learning. The question is what type of corrections will you end up using, and what are dog training corrections? TIP: If you need professional help for training your dog and yourself and you are looking for a dog trainer keep this in mind, if he or she claims that they only use positive reinforcement and never any type of correction/punishment either they are misleading you or even worse, they may have limited or no actual knowledge about dog training. Dog Training Corrections are anything that our dog finds to be unpleasant and as a result of that unpleasant stimulus he is more likely to stop performing that particular behavior. As mentioned many times throughout this website, timing is very important in a dog’s world. If the timing is wrong then there isn’t any learning happening. It is the same with dog training corrections, if you apply a correction at the wrong time or scenario, you will have missed the point. In order for a dog to create an association between his behavior/action and the correction itself, that correction has to be applied at the moment that the unwanted behavior is happening or immediately after wards. Anything over 1.5 seconds may already be too late. We use different types of corrections in dog obedience training and in our daily interactions with our dogs sometimes without even knowing it. How many times have you yelled at your dog in order to stop him from doing something (positive punishment)? How many times have you stopped while walking with your dog, because he was pulling, until he turned around before you would continue walking (negative reinforcement)? How many times were you just about to praise your dog, pet him or give him a treat for something he did or just for being cute, but then he started “misbehaving” in which case you stopped petting him, the treat is removed, etc. (negative punishment)? There are thousands of situations that we experience in our daily lives in which we use some type of dog training correction, but we often don’t think of them or realize that they are indeed corrections. These are not the correct scientific terms but we can use these four groups to classify any type of social interactions (or a dog’s interaction with the surrounding environment) that we have with our dog. Social pressure is probably the most used correction in dog obedience training and in our dog’s daily life. It is the first type of dog training correction that we use in order to stop our dog from continuing a given behaviour (action). The reason that we use it the most frequently, is because of our own human sociological structure. Yelling at someone will get their attention and in many cases is enough to make them stop doing what they were doing. One thing distinctive element about this category (and similar to the Withholding a Reward category that we will see next) is that there isn’t any physical contact between the handler and the dog; it is in most cases, simply in the form of warning “signals” that we send out delivering the message of “you’d better stop or else”. Is “social pressure” enough of a corrective dog training method? This depends on many factors, the situation itself, the behavior that the dog is displaying, the dog himself (whether he is a sensitive dog or not), the other distractions present in the environment, etc. Most people find themselves stuck with social pressure corrections or even think that their dog actually understands them. I once knew a gentleman who was convinced that his dog listened to him based on the verbal threat that he would “put him on a chain outside, if he did it again”. Of course this “threat” only seemed to work for so long before the dog was back to the same misbehaviors. Why? Simply because the dog understood that he was being yelled at (this interrupted his misbehavior, but he didn’t understand the actual words in the sentence or threat). Social pressure corrections can go only so far. Yelling for example, will work in the beginning until the dog realizes that “or else” actually means nothing and at that point, the dog becomes “desensitized” to this stimulus, meaning that he doesn’t react any more to it and he starts to ignore it. If you keep yelling louder; you will get your dog’s attention again, but only until your dog gets comfortable with that level of your voice. On the other hand, if you only use it sporadically on occasion, it will always have some type of effect on the dog. One of the laws of dog training corrections is that the correction needs to meet or overpower the current situation. For example, if your dog is chasing a cat, yelling might not do anything because the environment and the stimulus are both much stronger than you’re yelling (they are of a higher value to the dog). On the other hand, yelling at your dog in the kitchen as he sniffs at the edge of the empty table may make him act like he just got a cold shower. It is important to know and understand this rule, as pairing the wrong dog training correction with the wrong scenario will not produce the results you want or may even cause more damage than good. It is easier to deal with situations when your dog knows that you have something for him (a reward) and that only certain types of behaviors will “activate” you into producing that reward. When your dog understands this language you can create situations at different levels (distance, lower the “trigger”, etc.) and create the scenario in such a way that your dog can succeed and earn a reward. Of course the dog will “fail” on some occasions and it is then that you will withhold a reward, replaying the exercise until your dog succeeds. This way you can also replace your dog’s response to a certain situation by creating alternative behaviors. You can find more information about these techniques in the Behavior modification part of this website. If you are questioning the power of withholding a reward, I will note two particular researches that were done in Germany and in Mexico. Both tests involved working dogs and they were tested on their levels of cortisone (stress hormone) in their blood after each of the different types of dog training corrections. One of these correction types was withholding a reward. The results showed that dogs actually reacted more stressfully to withholding a reward than they did to an E-collar (electronic stimulation). Please note that these were controlled studies performed under the proper use of these tools and techniques. 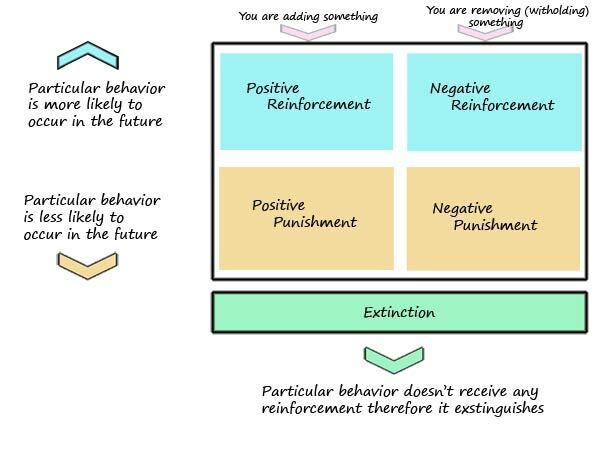 As much as it is advocated as a positive method of dog training, withholding a reward falls under the negative punishment part of the operant conditioning quadrants. It is still a punishment and it is stressful for dogs, therefore it must be used correctly. The reason I’m mentioning this is because I’ve seen too many dog owners and dog trainers overusing the withholding a reward correction to the point that the dogs simply stop working for rewards. TIP: A reward is a broad term, there are rewards like food and toys, or so called “life rewards” like petting and praising the dog, taking the dog for a walk as a reward, allowing your dog to play with other dogs as a reward, etc. For a reward-based system to work we need a reward that has a high value for our dog, which means that our dog will work hard in order to get it. In most cases that can be a certain type of food or a certain toy. As well, keep in mind that the more demanding the situation is, the more valuable that reward has to be. The level of your dog’s drives and instincts in certain situations. In these cases, you would need to step backwards in your reward-based training for your selected correction of withholding a reward to be effective, than work your way forward once again, but at a slower pace. When discussing physical corrections in dog obedience training and our dog’s day-to-day life, we need to try to separate this category into different levels. What actually is a physical correction in dog training? A physical correction is any type of dog training correction in which the action we perform is based on some type of physical contact in order to address a certain behavior. With that said, anything from a water squirt, throwing an object at a dog (many people use this type of correction even without thinking about it, like throwing a slipper, for example), leash corrections, dog training corrections made with various different tools, or anything else that you can think of that involves physical contact with the dog to stop an action goes into this category. A dog’s age is a fairly obvious factor. For example, you wouldn’t need to address a puppy’s behavior with a harsh physical method, simply raising your voice or a squirt of water will often do on most occasions (that is, if a correction is even really that necessary to begin with). Dogs have different types of temperaments. If you are, for example, applying a leash correction to a dog with a fearful temperament, that dog will probably shut down in some way or form. On the other hand, if you are dealing with a self-confidant dog, you may expect a fight back if you decide to apply a leash correction. One of the more common scenarios that you see when people train dogs using the so-called “old school” approach (escape/avoidance dog training) is “handler aggression” (which is actually quite a normal dog reaction to a physical force). Your relationship plays a huge role when applying physical dog training corrections. The more that your dog is comfortable with you; the more chance that you have for getting away with applying a physical correction on him. However, deciding to show your neighbour how to physically correct his German Shepherd may send you on an excursion to the hospital. A long time ago, military and police dog handlers used to be assigned to dogs, and were expected from day one to get out onto the training polygons and apply escape/avoidance training methods. The number of bites was very high. Years later, the practice has changed and for the few first weeks, dog handlers will just play with their dogs and spend some “quality time” together with them. By building a relationship first, the number of bites has decreased by over 85%. The level of your dog’s training is the most important factor. The more time you spend working and training your dog, the less often (if at all) you will need corrections. This is the most difficult factor to describe because it is as unique as each dog, each dog handler, and each situation. In addition to these, the above factors also play a role as well. One thing that you have to keep in mind when you are planning to deal with some situations and dog behaviors is what you are actually correcting. For example, many dog owners and even dog trainers often approach these situations from the wrong angle. An older colleague of mine who is an “old school” dog trainer didn’t believe in desensitizing and counter conditioning techniques when dealing with his dog that had issues with strangers, so he decided to deal with the issue by using the e-collar instead; by applying a “correction” each time his dog would react to strangers. The result was the opposite of what he wanted. The dog simply stopped giving warning signals (growling, barking) before reacting to a stranger. The reason for this is simple. Our dogs don’t actually understand what we want from them unless we show them first. In this case, his dog could have associated the corrections to a specific place, to a particular man or woman, to people that wear darker clothes, to joggers because they are running, etc. There isn’t anyway to know what conclusions that the dog would have drawn based on correcting him with an electronic stimulation every time he reacted to any stranger. The dog could have associated the corrections to a hundred different things. In his case, his dog associated the corrections with the growling, and so he stopped that part of the behavior, and he continued to react to people, but now without “warning”. Even though this looked like a simple, pretty straight forward, black and white plan that should have worked, from our human perspective, there were numerous aspects involved that allowed the dog to draw the wrong conclusion. In the dog training world we call this “cross associations” or “superstitious behaviors”. This is the reason that it is not recommended to use physical dog training corrections around people, or other animals. In the case of superstitious behaviors you may end up with more problems. In addition to that, receiving a physical correction while in a heightened state; could sometimes trigger the dog’s unwanted behavior even more. Dog Training Corrections are as the name says; corrections. They are not a training method but the type of consequence to a behavior that a dog has to be very well aware of. If we are applying corrections in situations where the dog doesn’t know what he was supposed to do instead and we rely on the idea that the dog should “clue in” this is unfair and nothing short of abuse. Many top class professional dog trainers will say that you are to use dog training corrections ONLY when you are dealing with the exercises that your dog has already learned, completed the generalization process for, done the same exercises in “x” number of successful repetitions and when you are a hundred percent sure that your dog is actually disobeying you. What you will discover is that if you follow this rule, you will end up using a very small amount of dog training corrections (if any at all) and you will get results from them, when you do need to use them. This is the type of dog training corrections that many people don’t practice, but that can be great training tools in your dog training bag. The key here is to set up a scenario in such a way that your dog will associate the correction with a certain action or a certain object/environment. One of the old tricks to stop a dog from getting up on the sofa for example, is to place mouse traps upside down on the sofa and cover them with a cloth. When the dog would jump up, the mouse traps would get triggered creating a snapping noise and scaring the dog away from the sofa. This is an environmental correction, in which it was the environment (in this case, the sofa itself) that corrected the dog. In some parts of the world where there is a possibility of dogs encountering deadly, poisonous snakes, people use E-collars to create the same effect. For example, they will pair the sound of a rattle snake with a strong correction, after a certain number of repetitions the sound of a rattle snake becomes a conditioned punisher (the dog associates the unpleasant feeling with that sound and avoids it as soon as he hears it). Dog Training Corrections are not training methods. The proper use of corrections makes up a part of a full training plan, but they are not a training plan on their own. With most dogs, physical corrections are not always needed (if at all). As mentioned above, dog training corrections are not training methods. If that is the approach that you thought of taking, you are better off training your dog differently. In some cases, like these two environmental corrections mentioned above, you may get away with using correction to produce the results that you want, but on the other hand, as in the example with the physical corrections, you may run into superstitious behaviors and your dog may draw a completely wrong conclusion from the exercise. Out of all the tools available, a dog leash is the one that we use most often to apply dog training corrections in obedience training. I won’t go into details about how this works; rather, I would like to point out the negative side effects that may occur. Improper usage of the leash is the number one reason for dog leash aggression. There are also side-effects of using the leash for dog training corrections. Dogs have much faster reflexes than we do, and they feel every move of the leash, and on top of that, they are great at anticipating. If you have overused the leash at some point in your training or you are dealing with a dog that reacts to leash corrections, you may notice (if you are fast enough) that when you plan to apply a correction with the leash, your dog actually “prepares” himself for the oncoming correction beforehand. The reason for this is that he has learned how to read the signals prior to the correction. The problem with this is that every time you are about to give a dog training correction with the leash, your dog refocuses from whatever he was doing to you, in anticipation of a correction. By that time, the correction is useless as you will end up correcting your dog for looking at you or something completely different, than what your original intention was. Remember again, the 1.5 second timing that is required for the best chances of creating the proper association. It is easy to make mistakes, especially when dealing with dog training corrections in obedience training. The price we and our dogs will pay for these mistakes may be enormous. Always remember that whatever correction you are using for a certain behavior or scenario; always stick with the “rule of three”. If it didn’t work after three times, either your dog doesn’t know what to do instead, or you are doing something wrong, so change your approach.